We are moving closer to the Big Sky dream scenario of a regular season finale featuring 14-1 Weber State traveling to take on 14-1 Montana, as both teams took care of business on Saturday night. 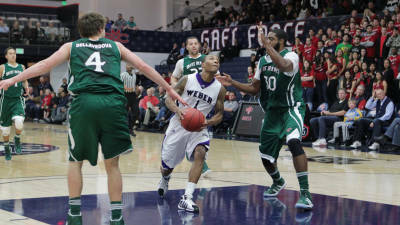 Weber State hosted Eastern Washington, and won a hard-fought contest 84-75 over an Eagles team that could have really used the win. It was the type of game that showed why Eastern Washington could be a dangerous team in the Big Sky tourney if they make it. Eastern Washington stayed in it despite a poor night from Collin Chiverton, who finished with just seven points. He found time to fire up 13 shots in just 17 minutes, missing 11 of them. Cliff Colimon led the team with 20 points, but he turned it over 7 times. Parker Kelly continued his ascent up the depth chart, as he may have been the best player for them on this night, finishing with 17 points on 10 shots (including 5/8 from downtown). The freshman walk-on has been one of the most pleasant surprises of the conference. The Wildcats did not get a great shooting night out of Damian Lillard (4/13) but he found different ways to contribute. He got got to the line 12 times (making them all), so he finished with a game-high 22 points. He also had six rebounds and four assists. Continuing their run of nice balance, four other guys were in double figures, led by Byron Fulton's 16 points (and 9 rebounds). Weber State is now 20-4 on the year. EWU sits at 5-7 in the Big Sky, just a half-game ahead of Northern Colorado, who they host on Wednesday night. In the other game, it looked like Montana was in serious trouble against Sacramento State, but they battled back to win 67-58 to finish 7-1 on the road (their best since the mid 1970s). It was their eight straight win and 14 out of 15, stopping Sacramento State's streak of four straight wins. The Hornets led 32-27 early in the second half, before the Grizzlies went on a 16-2 run helped by their 1-2-2 press, the same thing that was so instrumental in beating Northern Colorado. Eventually, Montana built the lead to 49-37 (helped by a Brian Katz technical), before the Hornets went on a 7-0 run to cut the gap to five. However, just when it looked like they were back in it, they made the kind of mistake that costs team's ballgames. Konner Veteto swatted a Derek Selvig shot, then taunted Selvig, drawing a technical. As it turned out, that was all she wrote for the Hornets. Montana made the free throws and drained a three, and the lead was never lower than eight the rest of the day. Sacramento State fans are not happy with the refs, but I can't comment too much on that since I did not see enough of the early second half where many of the complaints come from. But it seems to me that Sac State was undone more by lack of composure, both with the Grizzlies press and with frustration by the refs. Sac State did a nice job on Will Cherry (who still had 17 points) and Kareem Jamar, but it was the seniors that led Montana. Derek Selvig had 14 and 14, and Art Steward had 16 and 8. 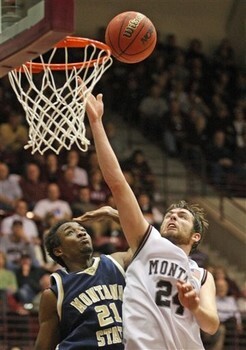 The Griz improve to 19-6, and will finish out the regular season at home. The Hornets drop to 4-9 in the Big Sky, and every game is must-win from here on out. Even one more loss could end their chances of making the Big Sky tournament.